But the situation is extremely fragile, which is not good news in a region where sabotaging agreements and derailing initiatives comes easier than sober compromise. While many of the key players have already begun backing away from their previous “red lines,” there remains one major obstacle: Turkey. The 2012 Geneva agreement called for “the establishment of a transitional governing body, which would include members of the present government and the opposition, an inclusive National Dialogue process, and a review of the constitutional order and the legal system.” Implementation dissolved in the face of intransigence on all sides, and stepped up support for the armed opposition by Saudi Arabia and the other Persian Gulf monarchies, plus the United States, Turkey, and France. But that approach runs counter to Turkey’s strategy, which has as its centerpiece the ouster of Assad. Indeed, the government of President Recep Tayyip Erdogan argues that defeating the Islamic State is secondary to overthrowing the Damascus government, and that once Assad is gone, the Islamic extremists will disappear. But aside from the Syrian Army, the PYD is the only serious military force resisting the Islamic State, a fact that even the U.S. government has come around to recognizing. Initially reluctant to support a group tied to the PKK — officially designated a “terrorist organization” by the U.S. and the European Union — the Americans have done a 180-degree turn, supplying the PYD with arms, ammunition, and food. Under pressure from the United States, France, and Britain, Turkey allowed a modest number of Kurdish peshmerga forces from Iraq to cross the border and fight in Kobani, and agreed to train insurgents, including Kurds, to fight in Syria. But whom those soldiers will fight is hardly clear. So far, the Erdogan government has refused to allow the United States to use its huge Incirlik air base to bomb Islamic State forces in Syria and Iraq unless Washington agrees to support Ankara’s four demands: a no-fly zone over Syria, a “safe zone” on the Turkish-Syrian border, training of rebels, and equal targeting of the Islamic State and the Assad regime. What a “safe zone” would actually involve is still unclear, although Turkish Prime Minister Ahmet Davutoglu says it should include the five northern cities of Idib, Latakia, Hasakah, Jarablus, and Kobani — a hefty slice of Syrian territory. And for the United States to establish it by force would certainly violate international law unless it had UN sanction, and Russia is unlikely to permit that. It would also put the Obama administration at odds with its Kurdish allies in Kobani, who see the “safe zone” as just an attempt by Ankara to meddle in Kurdish affairs. The “no-fly zone” would require the United States to smash up Syria’s air defense system and ground its air force. That would not be terribly difficult — though it has risks — but it would mean that the U.S. would essentially be at war with Syria. “No-fly” zones also don’t have a particularly good track record in the region. The United States imposed no-fly zones in northern and southern Iraq for over a decade, but it took the U.S. Army to overthrow Saddam Hussein. As for equally targeting the Islamic State and Assad, not even the Turkish public supports that. A recent poll found that 66 percent supported military action against the Islamic State, but not Ankara’s goal of regime change in Syria. Only a slight majority thought Turkey itself should take part in military actions against the Islamic State. In October, Turkish authorities in Gaziantep, a city 40 miles north of the Syrian border, seized dozens of suicide vests, hundreds of pounds of powerful C-4 explosives, grenades, and Kalashnikov rifles. Local authorities say that the Islamic State is active in the area and has cautioned Westerners they might be potential kidnap victims. There are also proposals for local ceasefires that might lay the foundation for a general peace agreement. The UN’s special envoy to Syria, Staffan de Mistura, is trying to work out an armistice in Aleppo, Syria’s largest city. Russia supports the proposal and de Mistura said the Damascus government expressed “constructive interest” in such an agreement. In early December, De Mistura met with Hadi al-Bahra of the Western-backed Syrian National Coalition and the following day with various rebel groups in Gaziantep. According to Al-Monitor, the plan would “focus on the real threat of terrorism as defined by the resolutions of the Security Council,” reduce violence, and move toward a “political solution.” Under the terms of the ceasefire, all groups would keep their arms. This latter point is an important one, because an earlier ceasefire in Homs required disarmament, an action that many of the opposition groups interpreted as surrender. But the Erdogan government is not happy with a focus on “terrorism” that doesn’t include the Assad government, a posture that has isolated Turkey regionally and internationally. At the 60-nation meeting in Brussels on December 3, Turkey’s argument equating the Islamic State and the PKK received zero support. 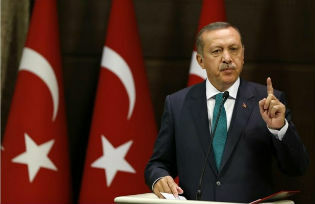 “Erdogan’s fixation with regime change in Syria has blinded his practical decision-making,” Suat Kiniklioglu, a former member of parliament for the president’s Justice and Development Party, told the Financial Times. Ankara’s obstinacy around Kobani touched off riots that killed more than 30 people in Kurdish towns and villages all over Turkey. And it threatens to derail one of the Erdogan’s more successful initiatives: peace talks with the Kurds. Ankara is certainly in a position to cause trouble. It has already permitted rebel groups, including the Islamic State, to ferry fighters and supplies through its long border with Syria. So it’s hard to imagine a lasting peace without a buy-in from Turkey. Getting all the rebel groups on board will be no picnic either. The Islamic State is not interested in talking with anyone, and the Free Syrian Army has little support inside the country. The Kurds are willing to talk, but about what? Autonomy? The very thing that Ankara fears the most? In Washington, will the newly resurgent Republicans in Congress — along with some Democrats and presidential hopeful Hillary Clinton — balk at anything that keeps Assad in power, even if only temporarily? And, by the same token, will the Syrian government be deluded into thinking it can win a military victory?